Robert Campbell Hamilton was born at Newry, Ireland, on 11 August 1883, the youngest child of James Hamilton (1842-1891) and Maria née Campbell (1842-1935). The Hamilton family migrated to Australia on board SS Riverina in the year 1889. Mr James Hamilton died shortly after their arrival in Brisbane when Robert was only eight years old. Mrs Hamilton and her young family lived at Enoggera Terrace, Redhill (now Red Hill). Robert Hamilton began his schooling at Petrie Terrace State School where he obtained third place among scholarship winners at a time when Brisbane Grammar School offered a limited number of scholarships. In February 1897, he took up this scholarship which was later extended to December 1901 when he completed the Senior Examination with passes in English, French, Latin, Greek, History of Europe, Ancient History, Algebra, Geometry, Trigonometry and Mechanics. In the Department of Public Instruction, he began as an assistant teacher at Irvinebank, North Queensland where he taught for three and a half years. Four years at Woolloongabba State School followed, then five years at the Central Technical College and Day School in Ann Street. At Gatton State School he served as teacher in charge of the Secondary Department for one year. He succeeded in gaining a university education by part-time study. He completed his first year arts as an external student of the Melbourne University in 1910 and matriculated for the Faculty of Arts at the University of Queensland in March 1911. He was amongst the first five students of the University of Queensland to graduate. All five (two women and three men) had started their degrees in other universities – all Bachelors of Arts. The 1913 graduation ceremony was held in the Central Technical College in the precinct of the then University grounds of Old Government House in the city. Robert Campbell Hamilton was appointed Acting Principal of Warwick Technical College and High School from July 1914 to 1916. He enlisted at Toowoomba for service abroad in the AIF on 9 February 1917 at the age of 33 years, 6 months. He nominated his mother, Maria Hamilton of 'Arran Villa', Enoggera Terrace, Redhill was his next of kin. Attached to 25th Reinforcements of 9th Infantry Battalion, Private Hamilton, service number 7490, embarked from Sydney on board HMAT A20 Honorata on 14 June 1917. In England he was promoted Lance Corporal and attended a course of instruction at an Officers’ Training School, Tidworth. At his own request, however, he reverted to the ranks. In February 1918 he was transferred to the 52nd Battalion for service at the Front. He was engaged in trench warfare in France till 5 April when he suffered a gunshot wound to the left hand rendering him unfit for further active service. He was transferred to hospital in Southern England. 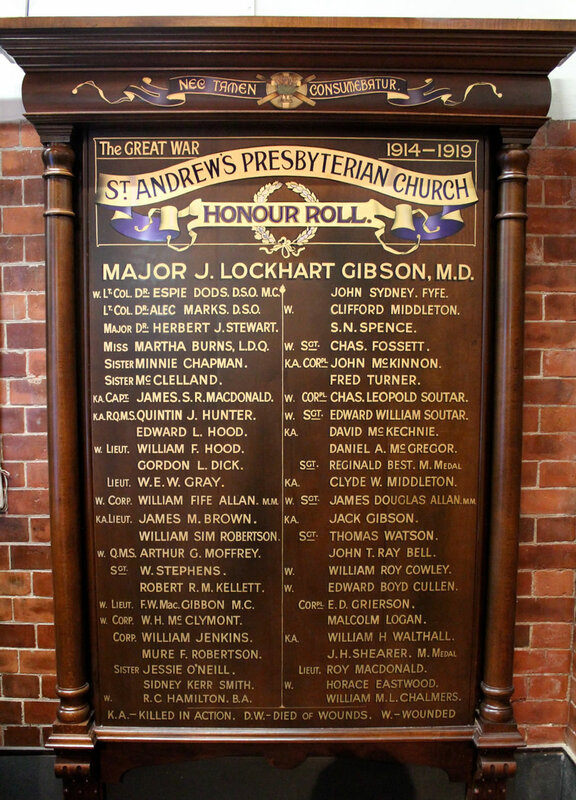 It was at this time that Chaplain Merrington, based at Tidworth, the main military centre for many British field units and the AIF, visited Private Hamilton. In his Memoirs, Rev E. N. Merrington refers to his call at Hurdcott where he saw “one of my St Andrew’s young men, R. C. Hamilton”. After hospital treatment R. C. Hamilton entered the School for Education Officers at Cambridge. He was appointed 2nd Lieutenant, Education Officer, 15th Battalion in France in November 1918. By way of non-military employment in England after the war, arrangements were made by the Board of Education, London, for Lieutenant Robert Campbell Hamilton to tour Technical Colleges and Secondary Schools in the United Kingdom from 3 May to 3 September 1919. He returned to Australia per HT Nestor, and his AIF appointment was terminated in January 1920. He was reappointed to Warwick High School as Principal, the position which he had held early in his career. On a Monday evening, 9 August 1926, Robert C. Hamilton and Estelle Haddon Page (1899-1969) married at Grafton Methodist Church. Estelle Page was well known in the Clarence River district for her musical abilities as mezzo soprano and accompanist and ardent work in the Methodist Church and choir. Mr R. C. Hamilton BA retired as Principal, Warwick State High and Intermediate School in December 1948. The school magazine referred to his splendid record and that he had “guided the destinies of the school for 34 years". Mr Hamilton was active in the local community in many ways. He was a member of the Warwick Historical Society. During the Second World War he was appointed Divisional Officer (Warwick), Air Raid Precautions (ARP). He also served as a Universikty of Queensland Senator from 1944 to 1949. Mr and Mrs Hamilton moved to live at Potts Point, Sydney in December 1948. Robert Hamilton was a Life Member of the National Parks Association and contributed various articles to several organisations and publications on explorers Allan Cunningham and Patrick Leslie. He worked on and presented detailed maps of Cunningham's Trips in 1824, 1827, 1828 and 1829 and presented a paper to the Royal Australian Historical Society where he was a member. In November 1964 he was awarded a Fellowship by the Royal Historical Society of Queensland. Hamilton's research is held in the Mitchell Library (Sydney), John Oxley Library (Brisbane) and the RHSQ (Brisbane). Robert Campbell Hamilton died at Weston Private Hospital, Darling Point, Sydney on 22 March 1968, aged 84 years. Mrs Estelle Hamilton died at her home at 17 Byron Hall, 99 Macleay Street, Potts Point on 5 February in the following year. Both were cremated at the Northern Suburbs Cemetery. • Hamilton, R.C., Alan Cunningham, with special reference to his work in what is now Queensland, unpublished tuypescript, State Library of Queensland.